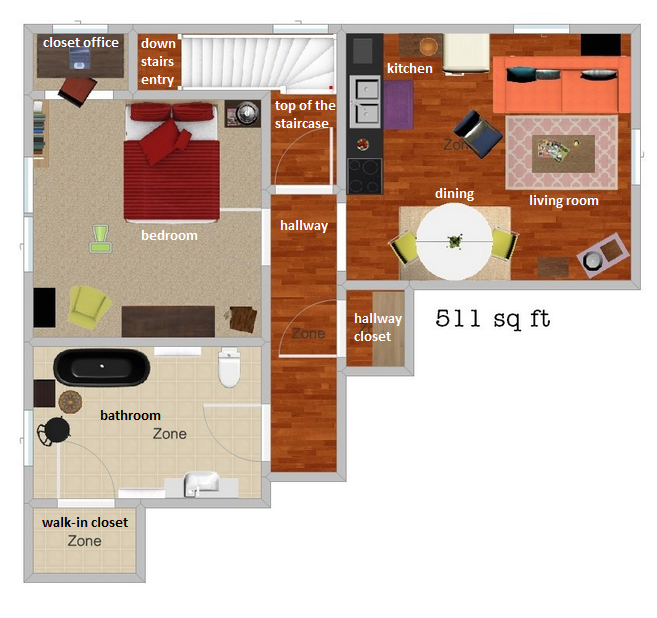 I love floor plans. When I was a little girl, you'd often catch me toting around my spiral-bound notebook of graph paper in which I sketched up big castle-like dream homes, small city apartments, and sometimes ancient Roman villas. While driving past houses, I immediately imagine what the floor plan could be like – especially in older homes. And even today, one of the first things I do when moving into an apartment (or even apartment hunting) is to make a mock-up floor plan to see how I could fit my furniture. My door is at the bottom of the stairs. You walk up a (quite steep) set of stairs and come to another door – this one with glass panes and just for pretty. There, you're faced with a long hall that I imagine once ran most the length of the second floor. Branching off of this long hallway with gorgeous hardwood floors are four doors: a door to the bedroom, a doorway to the living space, a closet door, and the door leading to the bathroom. While it's a good sized room (about 15' by 13') it combines my kitchen, dining area, and living room into one space. It's a light tight, but I prefer to say it's cozy. ;) Plus, it's turned out to be quite convenient to be able to cook while entertaining or turn the record over during dinner. My bedroom is a bit smaller than the kitchen / dining / living room – which makes it feel massive since it only serves the one purpose. I love that it's spacious and open though. The bedroom closet oddly has a window in it. Not a little window to let in a bit of light, but a large window like the ones throughout the apartment. So I turned this closet into an office nook. It's nice to keep my desk area somewhat separate from the bedroom, but close enough that I can jump out of bed with a great story idea. Not to be left out, this is the biggest closet in the place. It's a walk-in with shelves built in down one side and overhead. Currently, it's jam-packed with boxes from my last move that I never got around to unpacking, going through, and downsizing. I have big plans for this big closet though! Take a quick photo tour of my apartment here.